The thinking man's AMG E-Class gains a hybrid-assisted straight-six - can it compensate for the missing V8? Who actually drinks Diet Coke out of choice? Maybe out of habit, convinced you're getting a flavour of the real thing without any of the nasties. But it's never the same without the sugary hit. 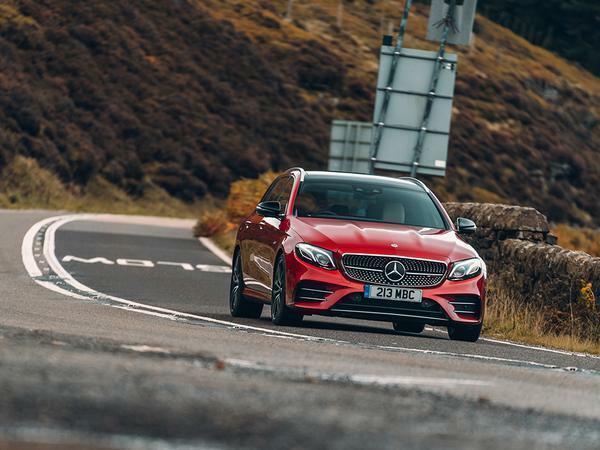 Arguably the same can be said of AMGs, the traditionally yawning gap between 'civilian' Mercs and the heavy metal flagships is now filled by a new generation of AMG Performance models like the V6-powered '43 versions of the C- and E-Class and, more recently, the new A35. Same brand. Reduced heart-racing stimulants. Saying that maybe Diet Coke's not all bad, and a guilt-free means of enjoying the same flavour. Applied to the E-Class we've previously enjoyed the E43, its 401hp twin-turbo V6, 4Matic all-wheel drive and downplayed looks offering the AMG experience with a more realistic entry price and running cost. Mercedes buyers have, of course, had the option of AMG floormats and trim packages for years and enthusiastically gussied up their diesel C-Classes accordingly. 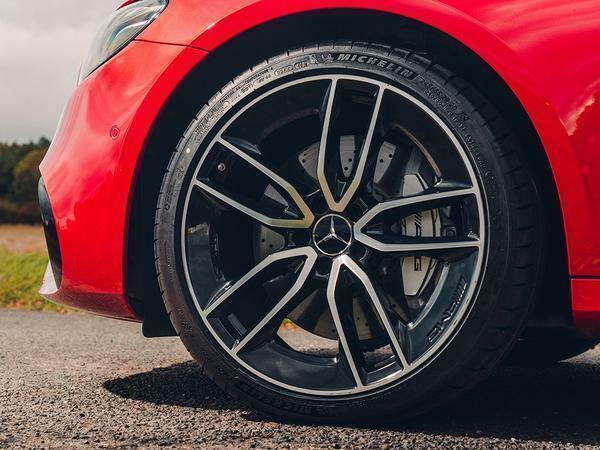 But we're assured these AMG Performance models genuinely do benefit from the engineering expertise of guys who supposedly don't get out of bed for anything less than a 500hp V8. 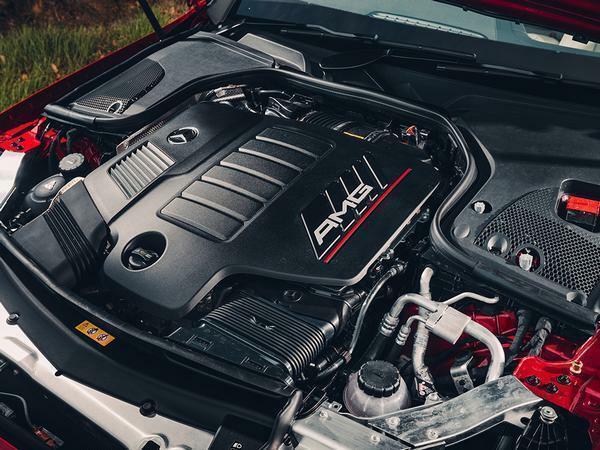 It must have worked because the '43 range has been reborn and reinvigorated with the addition of AMG's super-tech, 435hp version of the new Mercedes straight-six. A conventional, exhaust-driven turbo wasn't enough. Nor was an additional electrically powered one. And so for the first time we have a proper hybrid AMG, the E53 gaining an EQ-branded, 22hp/184lb ft electric boost exactly like Lewis Hamilton's F1 car. Just kidding. That'll only come with the One, but the '53 motor is still a significant first step into an electrified world for a brand defined by its love of unapologetically excessive internal combustion engines. 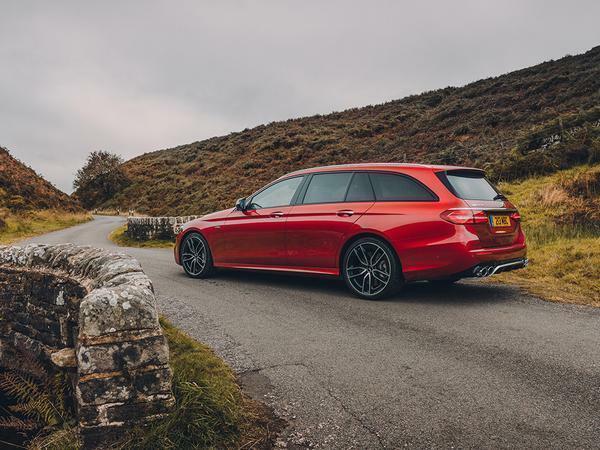 As an understated estate it makes an appealingly real-world alternative to the E63, the fact it's £30K cheaper and slots into the E-Class range between that and the £56K E400d offering it plenty of room to stand on its own two feet. We'll come to the engine but, fundamentally, the E53 follows the same format as its predecessor. 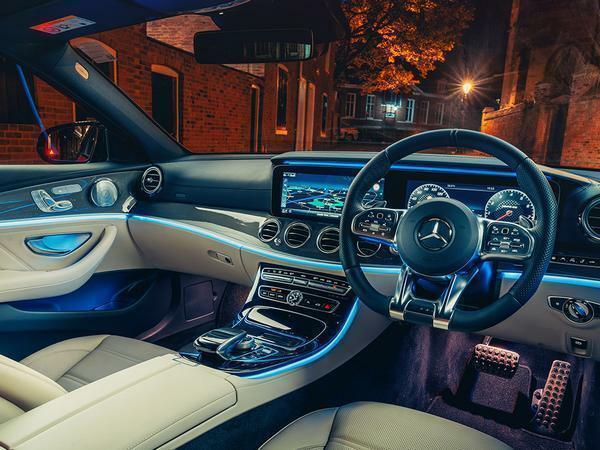 Which is to say specific AMG tuning for the multi-chamber Air Body Control suspension, a rear-biased all-wheel drive system and sharpened responses for the nine-speed automatic gearbox. 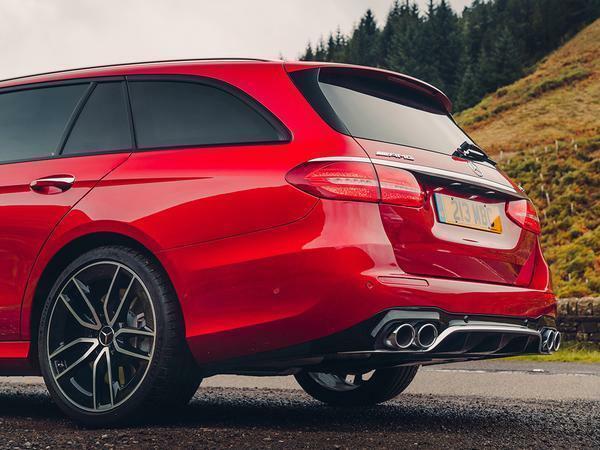 You of course get plenty of AMG-branded features, including 19-inch wheels and a bodykit on the outside and AMG Dynamic Select mode controls to elevate the driving experience over that of standard E-Class estates. There's also an AMG Performance Exhaust system, the apparently convincing quad pipes revealed to be bumper trim falsies on closer examination. 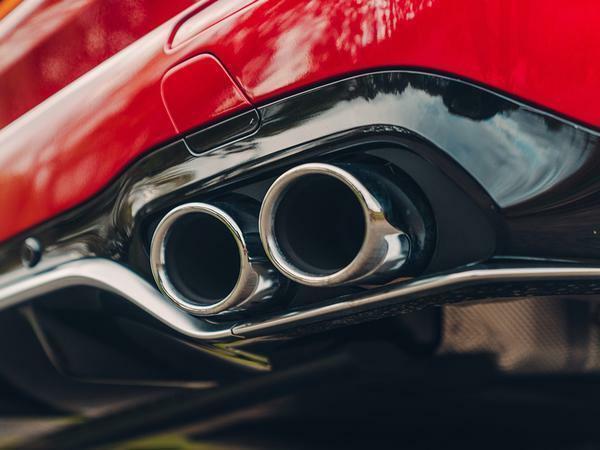 Direct rivals are notable by their absence, BMW has long-since given up on fast estates while Audi's best effort in the absence of an S6 is the V6-powered, 340hp A6 Sport 55 TFSI. 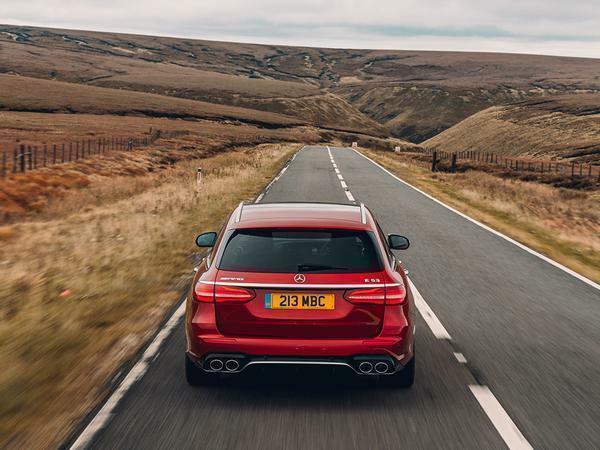 Jaguar does a 380hp supercharged petrol version of its appealing XF Sportbrake S but doesn't sell it in the UK, the top model here being the 300hp diesel instead. 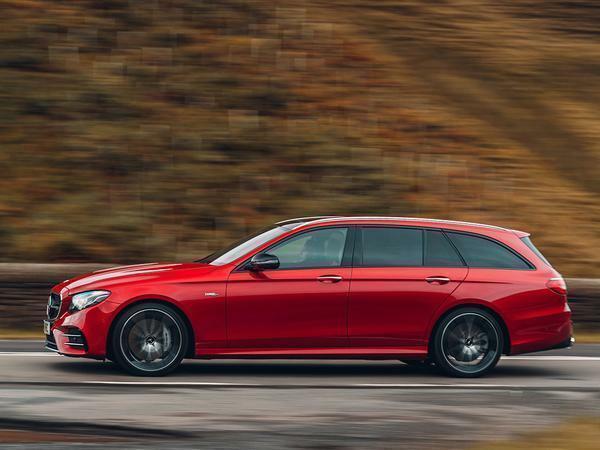 E-Class wagons have always been a thinking man's alternative to SUVs and crossovers, the more so with this technically intriguing engine and a return to the evocative straight-six layout. Its revival is less about a romantic association with tradition and more that long, thin engines free up space to attach turbos, electric motors/generators and associated plumbing. Whatever, the appeal of a big straight-six in this day and age is clear enough. And the new motor raises power from the E43's 401hp to an even more appealing 435hp, though combined 'system' torque is listed as a near-identical 383lb ft. That's only half the story however, the combination of the electric motor and the 48V-driven 'e-turbo' meaning there's a double-dose of lag-free boost available the instant you get on the throttle. 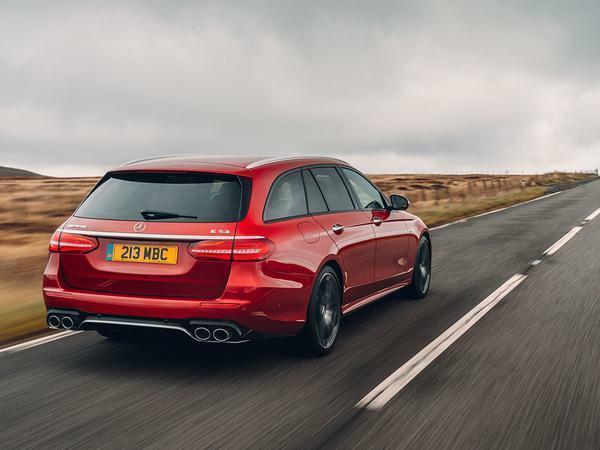 Where the E43's twin-turbo V6 had that familiar 'squashy' throttle pedal you get with most turbocharged engines the '53 immediately feels a lot sharper, that peak torque figure stretching all the way from 1,800rpm to 5,800rpm and usefully mitigating the wagon's burly two-tonne kerbweight. The fat torque band does beg the question of why you need nine gears though, the transmission's CVT-like enthusiasm for high-rev howling annoying enough to have you selecting manual mode to enjoy the formidable in-gear flexibility. While there's a sneaking suspicion of electronic enhancement it sounds good too, the new engine smoother and more sophisticated than the V6 it replaces. Whether you're mooching on the motorway or giving it a proper workout in the wilds this is a lovely powertrain, as impressive for its dazzling technology as it is the way it seamlessly deploys it to the road. Returning to the theme of the intro there's less of the pulse-quickening thrill you'd get from doing the same in an E63. 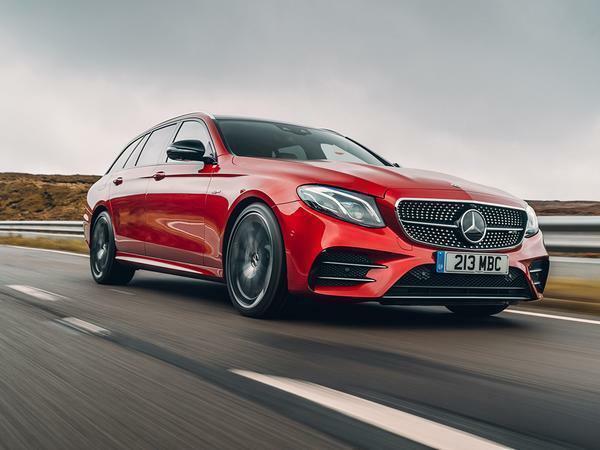 And the 4Matic system is very much geared to traction-enabled neutrality over rear-driven theatrics, though it maintains a light touch and the E53 has a pleasingly natural balance that does justice to the potency of the engine. Up to pace the suspension shows excellent body control and a nice combination of comfort and composure too, but even fancy multi-chamber air springs can't hide the weight of the thing and the low-speed ride has a disappointingly brittle edge. Some abrupt shifts from the gearbox also spoil the refinement when you're just cruising, this a rare dropped ball from a Mercedes automatic. No, it's no E63 substitute. 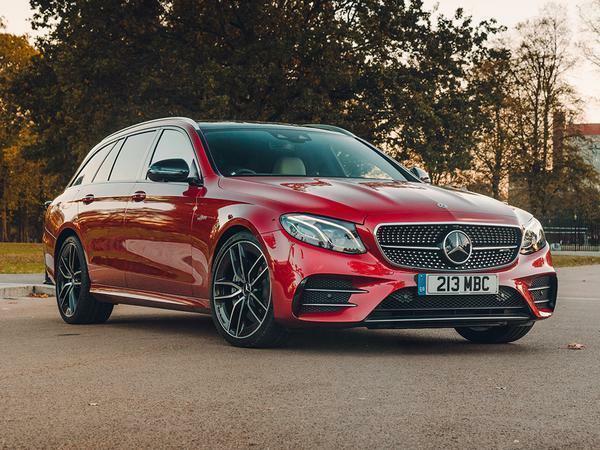 But as the V8 model moves into a new realm, the E53 combines a relatively attainable taste of the AMG experience with a genuinely impressive combination of technology and firepower, the sleeper vibe all the more satisfying for the fact there's nothing else at this price that combines such a broad range of talents. I’d like one of these! Perfect real-world subtle fast estate. No doubt a smashing car, but man do I hate fake exhaust pipes/trims...tyhe only thing worse than fake vents with the solid bits of ribbed plastic. Just seems lazy. Pretty sure that's the Snake Pass but not sure of the stone bridge pic. Goyt Valley?